Leeds United have agreed a fee for Brentford’s Stuart Dallas and expect to sign the winger in a deal worth more than £1million next week. Dallas will undergo a medical before taking up a three-year contract in a move which will end Uwe Rosler’s long-running search for a wide player. United’s head coach has been in the market for a player to fill the left side of his three-man attack and Dallas’ arrival will reunite him with another youngster he worked with at Griffin Park. Dallas - a 24-year-old from Northern Ireland - joined Brentford from Irish club Crusaders in 2012, at a time when Rosler was manager of the London club. He made a handful of initial appearances before joining Northampton Town on loan the following year but Brentford used him throughout their successful Championship campaign last season. He made 38 appearances and scored six goals as Brentford reached the play-offs. Earlier this month, Rosler brought in midfielder Tom Adeyemi on loan from Cardiff City - another player who worked under him at Griffin Park - and the signing of Dallas would fill a gaping hole in the German’s 4-3-3 formation. Leeds, who invested more than £2m in striker Chris Wood this month, are understood to be ready to pay another seven-figure fee for Dallas, potentially rising to around £1.5m. The winger’s contract is believed to include the option of a fourth year at Elland Road. Rosler, who has made six signings since taking charge as head coach of Leeds in May, admitted earlier today that he was confident of securing a winger, saying: “We’re always working. The successful bid for Dallas is likely to kill United’s interest in Sunderland winger Will Buckley, another of Rosler’s mooted targets. The former Brighton player - signed for £2.5million by Sunderland 12 months ago - is surplus to requirements at the Stadium of Light and will be allowed to leave for around £1.5m before the end of the transfer window. 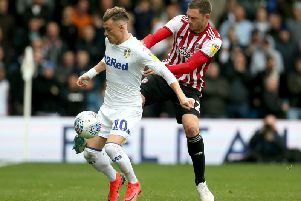 Numerous clubs including Leeds have expressed an interest in taking Buckley on a long-term loan but Sunderland are holding out for a permanent deal as they attempt to cut their losses. He was left behind when Sunderland flew out to Germany yesterday for a pre-season friendly against Hannover 96. Buckley’s valuation and his current wage - thought to be in excess of £20,000 a week - were also likely to be an obstacle for United and Rosler sidestepped talk of Buckley, saying: “It’s very important that I don’t like to talk about players who are not Leeds United players.